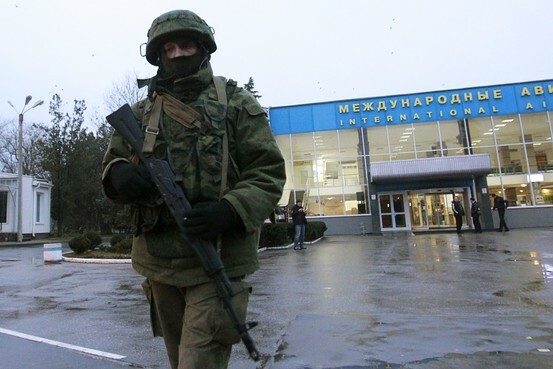 Armed men occupied two key airports in Ukraine's restive pro-Russia region of Crimea on Friday, a move that Ukraine's interior minister called an "armed invasion and occupation" by Russia, stirring already heightened tension in the country. Soldiers wearing camouflage and bearing automatic weapons took up positions at Belbek Airport in Sevastopol, home of Russia's Black Sea Fleet, and at the airport in Simferopol, the region's capital, Arsen Avakov said. He said the soldiers' uniforms bore no identifying marks "but they do not hide their affiliation with the Russian armed forces." Unmarked military vehicles lined the road leading to the Sevastopol airport. Soldiers there refused to identify themselves and blocked anyone from approaching the airport. A spokesperson for Russia's Black Sea Fleet denied that soldiers from the base were involved in blocking the Sevastopol airport.